Arctic Fashion presents the Porvoo necklace by Aarikka. 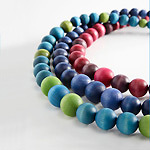 This eye-catching wooden bead necklace is ideal for spring and summer. Available in three vibrant colour combinations, wear it to liven up plain coloured clothes or to bring an outfit of complementary colours together. Choose from aniline and lilac to create a striking feminine look, blue and jeans blue for understated chic, or turquoise blue and apple green for a refreshing, summer feel. Fashionable and funky, this Scandinavian design is also environmentally friendly - each of the wooden pearls in the Porvoo necklace has been crafted using sustainable wood from Finnish forests. This means it is not only eco-friendly and durable, but wonderfully lightweight at 100 grams. Available to buy now for under £20, what's stopping you?